Below are a few Thanksgiving tips and suggestions for people with serious food allergies. If you have any questions, you should always consult with your healthcare provider. 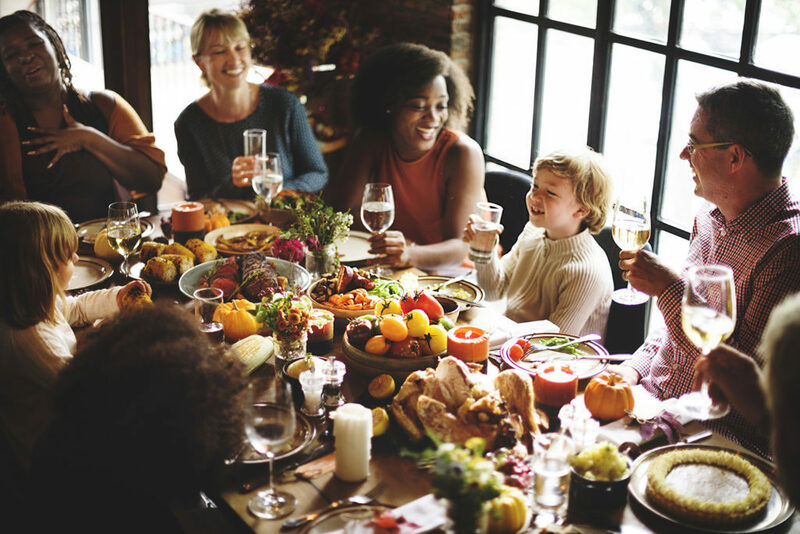 Thanksgiving can be great, but since “Turkey Day” tends to revolve around food, it can also be a challenge for those with serious food allergies. Thanksgiving often involves big meals with family, friends, distant relatives, acquaintances, and even total strangers. Social dynamics can crank up pressure to eat all the food that is served. Are you worried you’ll offend someone if you turn down food? Do others tend to downplay the seriousness of your allergies? ALWAYS be prepared for severe allergic reactions (Type I, including anaphylaxis), by carrying your epinephrine auto-injector with you. Emergencies do happen, even with the best of planning. If you notice a sign of this type of potentially life-threatening allergic reaction, use your epinephrine auto-injector as soon as possible, and then call 911. Of course, we believe it’s better to prevent reactions than to have to treat them! Below are some Thanksgiving tips. First of all, don’t be afraid to ask: “what’s in the stuffing?” When eating with a group, it’s better to be honest about having a serious food allergy and needing to eat a restricted diet. If you try to cover it up, your risk of anaphylaxis might increase. We believe your friends, family, and loved ones will understand – especially if you communicate the severity of the issue to them, educate them about your allergies, and remind them of your allergies before gatherings. Thanksgiving foods often include the top 8 food allergens, namely, peanuts, tree nuts, eggs, milk, wheat, soy, fish, and shellfish. These “top 8” are often found in Thanksgiving favorites, including stuffing, potatoes, cranberry sauce, pumpkin pie, veggies, and sometimes the turkey itself. [ACAAI]One sensible piece of advice: “When in Doubt, Leave it Out!” Why risk a serious allergic reaction over a food you’re not quite sure about? And if you’re cooking for someone who has food allergies and you have doubt about an ingredient, you’ll probably want to leave it out as well. If you’re hosting and preparing food, one strategy is to seek recipe variations that don’t include the allergen. You can search online for recipes that do not have the allergen – for example, searching for “nut-free dessert recipes.” Another good idea? Asking guests who bring food to also bring an index card that lists the ingredients – and then attaching the card to the dish. If you’re a guest at a party, and you have a serious food allergy, you may wish to talk privately with the host to make sure the meal goes off without a hitch. Also consider emailing the other guests, if you feel comfortable doing so. Another good plan: quietly pack backup food, in case you don’t feel completely confident about your food safety at the party. Of course, some people with food allergies are so highly-sensitive that even being in the same room with their allergen(s) can trigger a severe allergic reaction requiring an epinephrine auto-injector. If you know such a highly-sensitive allergic person… or if you ARE such a highly-sensitive allergic person…. or if you are the PARENT of such a highly-sensitive allergic person… then communication with all involved is key to help come up with a practical plan to keep everyone safe. The bottom line for people with serious food allergies requiring epinephrine auto-injection: Always be prepared. Feel free to ask about ingredients in the food… don’t think twice about preparing or bringing your own food… don’t feel self-conscious about hurting anyone’s feelings, because your health and safety are the most important factors of all… and carry your epinephrine auto-injector at all times!